The swaggering figure of the Reichsmarshal swept imperiously into the Air Ministry on Berlin’s Wilhemstrasse, his jewel-encrusted baton and extravagant uniform as flamboyant as ever. This was Saturday, 30 January 1943, the tenth Anniversary of the Nazi Party coming to power, and Goering was about to deliver the main speech in tribute to the Party and its leader, the Fuhrer - Adolf Hitler. The Royal Air Force had other plans for the anniversary. In stark defiance of the imagined air security safeguarding Berlin, brave pilots of 105 and 139 Sqn's took to the air in de Havilland Mosquito's, on course for Germany. Their mission: RAF Bomber Command’s first daylight raid on Berlin! The raid was timed to perfection and three Mosquito's of 105 Sqn raced headlong, low level towards their target - the Haus des Rundfunks, headquarters of the German State broadcasting company. It was an hour before Goering could finally be broadcast. He was boiling with rage and humiliation. A few hours later, adding further insult, Mosquito's from 139 Sqn swept over the city in a second attack moments before Goebbels addressed a Nazi mass rally in the Sportpalast. Goering’s promise that enemy aircraft would never fly over the Reich was broken, the echo of that shame would haunt him for the rest of the war. Anthony Saunders dramatic painting pays tribute to this pivotal moment in the war. 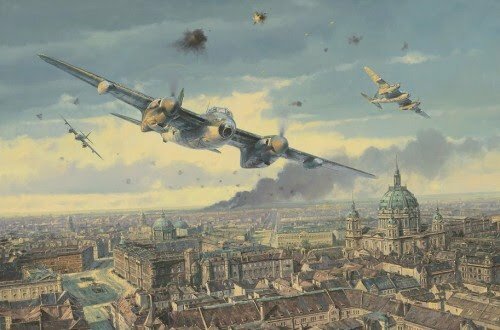 His masterful brush brings the scene into vibrant, spectacular life with painstaking attention to detail, capturing the Mosquito B.Mk.IVs of 105 Sqn departing the target area, following their successful strike on the Haus des Rundfunk. Importantly the Publisher has managed to trace no less than three highly distinguished Mosquito crew who flew many of those dangerous missions to Berlin, and that they have personally signed every print in the release. Flight Lieutenant KEN TEMPEST DFC He flew over 40 missions as a Navigator on Mosquito's, more than 20 of them to Berlin. Flight Lieutenant COLIN BELL DFC AFC Completed 50 operations as a Mosquito Pilot, including 13 missions to Berlin. Flight Lieutenant GEORGE DUNN DFC A Pilot, he flew 30 operations in Halifaxes and then 14 missions as a Pathfinder in Mosquito's to Berlin in Mosquito's.